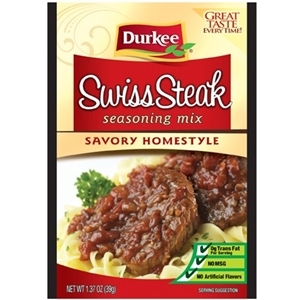 Sweet onions, parsley, garlic and spices make up Durkee Swiss Steak Seasoning Mix. 1.37 ounce packet. 1. With fork, pierce steak at 1/2 inch intervals. Cut into serving size pieces. 2. In a large bowl, blend seasoning, tomatoes and water; add steak. 3. Refrigerate for 15 minutes. remove steak; reserve liquid. 4. In a large skillet, brown steak in oil; drain. Add reserve liquid. Bring to a boil; reduce heat, cover and simmer 1 hour or until steak is tender, turning occasionally. Dehydrated Onion, Modified Food Starch, Salt, Wheat Flour, Sugar, Caramel Color, Garlic Powder, Spices, Beef Powder and Bromelain (From Pineapple).